Peter Sculthorpe was born in Launceston, Tasmania, in 1929. He was educated at Launceston Church Grammar School, the University of Melbourne and Wadham College, Oxford. Sculthorpe's catalogue consists of more than 350 works and, apart from juvenilia, a good part of it is regularly performed and recorded throughout the world. The composer wrote in most musical forms, and almost all his works are influenced by the social climate and physical characteristics of Australia. Furthermore, Aboriginal and Torres Strait Island music and the gamelan music of Indonesia were significant influences upon his musical language. His most recent works included the String Quartet No. 18 (2010), Shining Island (2011) for strings, and Pastorale (1949/2013) for orchestra. Significant, recent premieres also included the first performance, in 2013, of the cantata The Great South Land. The texts and musical material for the cantata were reworked from Sculthorpe's 1982 television opera Quiros. Sculthorpe had a deep love for his country and for its landscape, which he regarded as sacred. Because of this, one of the most constant themes in his output was the protection of Australia's environment, as well as that of the whole planet. His preoccupation with the frailty of the human condition can be found in works such as the choral Requiem (2004) and String Quartet No.16 (2006). The former grew from his concern about women and children being killed in the war in Iraq, the latter from the plight of people in detention. He was Emeritus Professor at the University of Sydney, where he began teaching in 1963. He also taught at music institutions and universities both within and outside Australia, and held honorary doctorates from Tasmania, Melbourne, Sussex, Griffith and Sydney. In 1977 he was appointed OBE and was the recipient of a Silver Jubilee Medal. He was appointed AO in 1990. The recipient of many awards, Sculthorpe regarded the most important as being chosen as one of Australia's 100 Living National Treasures (National Trust of Australia, 1997), Distinguished Artist 2001 (International Society for the Performing Arts), Honorary Foreign Life Member (American Academy of Arts and Letters, 2003) and one of the 100 Most Influential Australians (The Bulletin magazine, 2006). In 2012, Sculthorpe received the Award for Distinguished Services to Australian Music as part of the yearly Art Music Awards by Australian Music Centre and APRA AMCOS. Sculthorpe's work is discussed in books by Michael Hannan, Peter Sculthorpe: His Music and Ideas 1929-1979 (1982), Deborah Hayes, Peter Sculthorpe: A Bio-Bibliography (1993), and the composer himself in his autobiography Sun Music (1999). The first volume of Graeme Skinner's biography, Peter Sculthorpe: the making of an Australian composer, was published in 2007, and John Peterson's The music of Peter Sculthorpe in 2014. Sonata for strings No. 2 : string orchestra Commissioned by Australian Chamber Orchestra. Music for Federation : orchestra Commissioned by Melbourne Festival. Pastorale : orchestra (2013) Commissioned by HUSH Music Foundation. Island songs : for saxophone, strings and percussion (2012) Commissioned by Presteigne Festival of Music and the Arts Limited in association with St John’s, Smith Square, London with funding provided by the Beavis Foundation, Kevin Jones & Laura Woodside-Jones and John & Jenny Kendall. 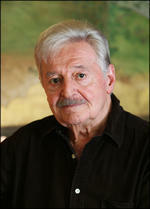 DVD: There's no time : Peter Sculthorpe, composer. Article: The sound of home / Julian Day interviews Peter Sculthorpe. Book: Peter Sculthorpe : his music and ideas 1929 - 1979 / Michael Hannan. Book: Peter Sculthorpe : the making of an Australian composer / Graeme Skinner. Book: Peter Sculthorpe : an Australian composer's influence / Gwyneth Barnes. Book: Sun music : journeys and reflections from a composer's life / Peter Sculthorpe. Article: Has Sculthorpe misappropriated Indigenous melodies? / Jonathan Paget. Book: The music of Peter Sculthorpe / John Peterson. DVD: The quartets / Peter Sculthorpe, with the Goldner String Quartet. Book: The music of Peter Sculthorpe : an analytical study with particular reference to those social and other cultural forces which have shaped the development of an Australian vision / by Michael Hannan. Book: Towards an Australian style : on the relationship between the Australian landscape and natural environment and the music of Peter Sculthorpe and Ross Edwards / Jeanell Carrigan. - Program note: Peter Sculthorpe's "Irkanda IV"
- Program note: Peter Sculthorpe's "New Norcia"
- Program note: Peter Sculthorpe's "Sun Music III"
- Program note: Peter Sculthorpe's "Mangrove"
- Program note: Peter Sculthorpe's "Love song"